Nsongi Natondo (front center right), Kahenga Thomas (front center), Ngoma Beni (front left) raise their hands to answer a class question at the St. Louis Primary School in Kinshasa, Congo. Education may take many shapes & sizes, but is always critical in the fight to end extreme poverty. What do you think of when you imagine school? The answer to that question could differ wildly from person to person, depending where you were born, or what circumstances you grew up in. What many of us would agree with, however, is that education is a driving force behind social mobility and — globally — behind breaking the cycle of extreme poverty. Without education, it’s so much harder for a child to grow up into a life that’s any different from their parents’. Without schools, it’s impossible for our world to change for the better. Quality education is a vital target of the UN’s Global Goals to end extreme poverty, and it’s one that drives many others: gender equality; decent work and economic growth; industry, innovation, and infrastructure; reduced inequalities; and peace, justice, and strong institutions, to name a few. A report released this month by the World Food Programme also made the connection between education and solving the world’s most pressing hunger crises — with 124 million people in 51 countries last year facing crisis levels of hunger. It said that if children were able to stay in school for just one more year, combined with improved road access, it would dramatically improve communities’ ability to withstand food crises. And yet, 263 million children around the world are still not in school. To celebrate how life-changing education really is, here is a snapshot of what it looks like in different countries around the world. For two hours a day, a DFID-funded Bus School comes to Kali Bari slum in central Delhi. 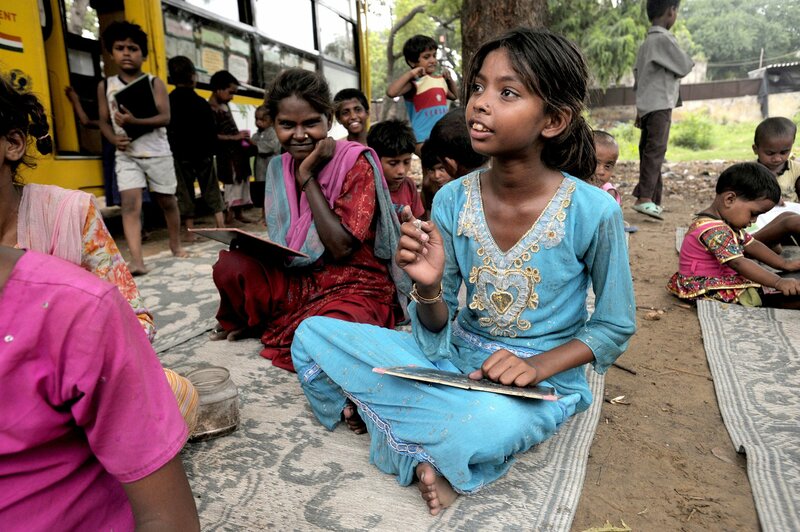 An estimated 8.1 million children are out of school in India, according to UNICEF. Meanwhile the country has a significant gender imbalance when it comes to education. While male literacy is at 75%, female literacy is 54%, according to India-based NGO Tarang. Pictured here is 10-year-old Bano sitting on mats outside a schoolbus, practicing her writing on a chalkboard. For two hours a day, the UK-funded Bus School comes to Kali Bari slum in central Delhi, where Bano lives, to offer free lessons to children who are eager to learn. Students try to get the teacher's attention to answer a question in Sudan. It’s estimated that some 3 million children between 5 and 13 aren’t in school in Sudan — one of the largest number of out-of-school children in the Middle East and North Africa region, according to UNICEF. Some 76% of children attend primary school, but that figure drops to 28% at secondary school. 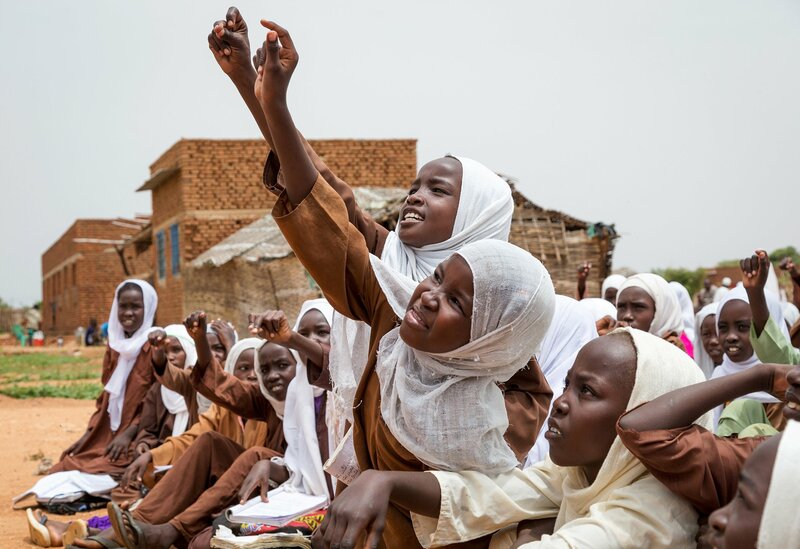 Here, students try to get the teacher's attention to answer a question in Sudan. The girls are sitting outside in the sweltering heat because their classroom made of local materials fell down in a recent storm. 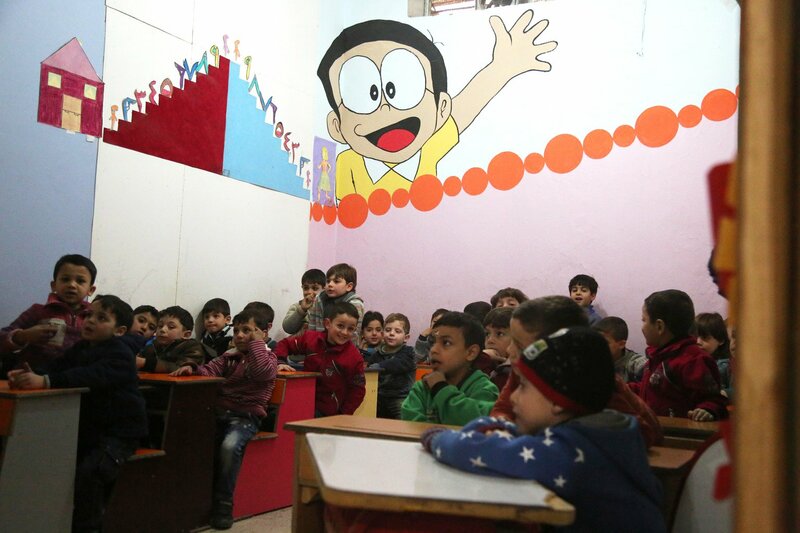 First-grade students attend a basement school in besieged East Ghouta, Rural Damascus in the Syrian Arab Republic. Schools have borne a significant brunt of the ongoing conflict in Syria, with more than one in three schools either damaged or destroyed, according to UNICEF. Meanwhile, others are being used as collective shelters, or for other purposes. Almost a third of school-age children (between 5 and 17) aren't in school, and a further 1.3 million are at risk of dropping out. Here, first-grade students attend a basement school in besieged East Ghouta, near to the capital Damascus. The children work together at desks while colourful paintings and cartoons decorate the walls. A girl writes at the blackboard at Ayno Meena Number Two school in the city of Kandahar, Afghanistan. Between 2001 and 2011, the number of children in school in Afghanistan jumped from 900,000 to 8.3 million, according to the UN. That’s largely because the Taliban’s control was weakened, and the global community supported the country with aid money. However, across the country, just 41% of schools actually have school buildings, and more than a third of all school-aged children are unable to go to school so they’re exposed to child marriage, forced labour, and radicalisation. In this picture, a girl writes at the blackboard at Ayno Meena Number Two school in the city of Kandahar. The US spends more on education than any other country in the world — but came in at No. 10 in world rankings on educational equality between the nation’s rich and poor children, in a 2016 UNICEF report. In this photo, two girls work on a fourth-grade math project together inside the newly renovated library at an elementary school in in Littleton, Colorado. Girls sit together in a classroom during language class in the Fatick region of Senegal. Senegal also has a big divide between male and female literacy rates. Among males aged 15 to 24, some 74% can read, according to UNICEF. Among females of the same age, the rate is just 56%. 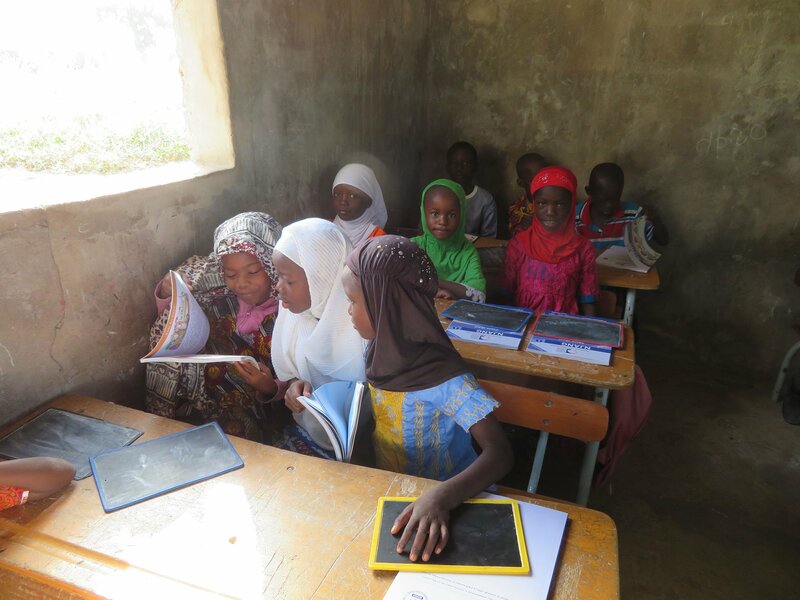 Here, girls sit together in a classroom during language class in the Fatick region of Senegal. Girls in school in Khyber Pakhtunkhwa, Pakistan. Malala’s home country of Pakistan has the second largest number of girls not in school in the world, according to the Malala Fund. Poor girls in rural areas are 16 times less likely to be in secondary school than boys from the wealthiest households. Here, girls are pictured in school in Khyber Pakhtunkhwa, in the northwest of the country near the border with Afghanistan. In Britain, school is mandatory from five through to the age of 16, and the UK is home to two of the world’s top 10 universities. Of Britons aged 25 or over, 99.9% have had a secondary education. In this photo, a primary school pupil completes her school work in a classroom at the school in Bristol, England. Students engage in arts and crafts at the temporary school structure in Nepal. The devastating 2015 earthquake in Nepal caused serious damage to the country’s education system, with as many as 8,000 schools destroyed. It disrupted education for some one million children, according to Plan International. Things are stabilising, but the relief effort is still working to ensure that every child — particularly those in remote communities — is able to access a quality education. Here, students do arts and crafts at a temporary school structure in Nepal. According to a UN report over 32,000 classrooms in both public and private schools were destroyed beyond use by the earthquake. Children in class at the Tim Hines school in Tegucigalpa, Honduras. 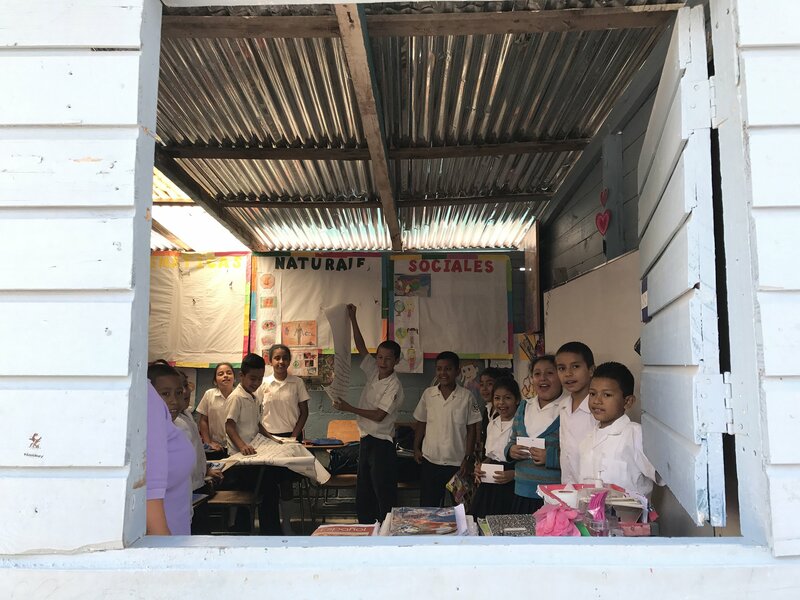 Honduras has among the lowest education indicators in the Latin American and Caribbean regions, according to children's charity Bless the Children, with just 30% of children going to high school. Here, children are pictured in class at the Tim Hines school in the capital city Tegucigalpa. 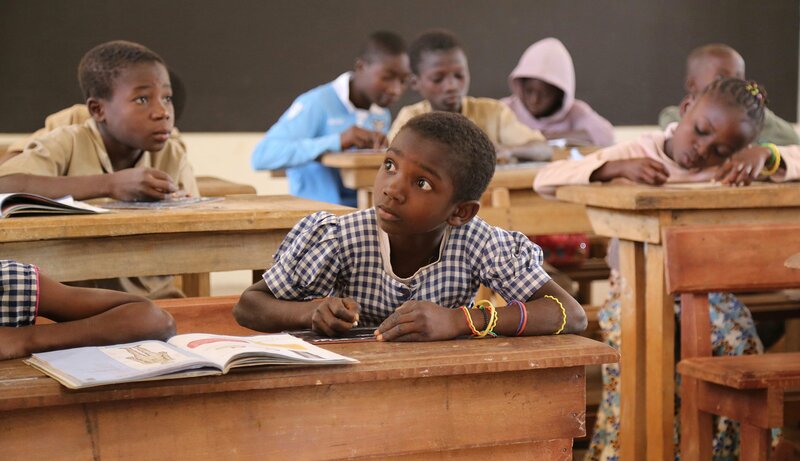 Children are photographed in their Grade 4 classroom in Public Primary School in Mamakoffikro, Côte d'Ivoire. Almost one in every two children between 6 and 11 doesn’t go to school in Côte d'Ivoire, according to UNICEF, with a considerable difference between urban and rural areas — 66% to 48%. The low education rate is largely because there aren’t enough teachers or school buildings, and children who do make it to school don’t always get quality teaching. In this photo, children are pictured in their Grade 4 classroom in Public Primary School in Mamakoffikro. Japan is one of the world’s top-performing countries for literacy, science, and maths, according to the World Economic Forum. Children in Japan do six years of elementary school, three years of junior high school, and then three years of high school before they decide whether or not to go to university. While high school isn’t necessary, enrolment is about 98%. Here, students take an exam as the teacher looks on in a classroom at a Tokyo Korean high school in Tokyo. A young girl with her class drawing on a slate, Wat Bo Primary School, Cambodia. While 85% of boys and 83% of girls go to primary school in Cambodia, according to UNICEF, for secondary school that drops to 39% for boy and just 35% for girls. 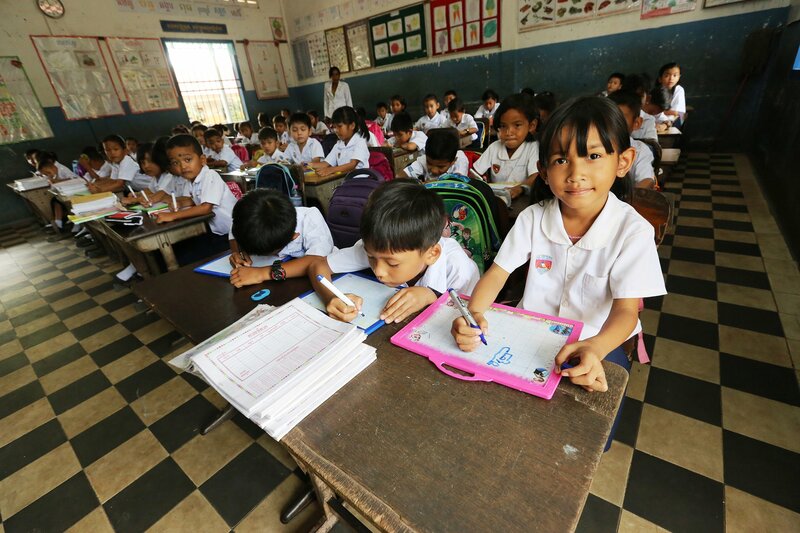 Here, a young girl is pictured with her class drawing on a slate, at the Wat Bo Primary School, Cambodia.